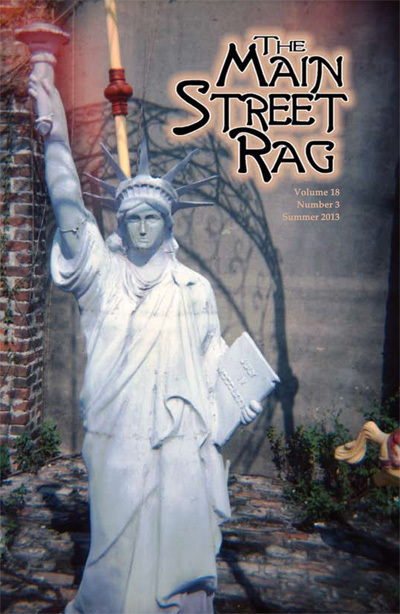 The Summer edition of The Main Street Rag, our quarterly literary magazine, features an interview with artist Bryce Lankard by Lynda C. Ward along with poetry, fiction, reviews, photographs along with shop talk and commentary by Managing Editor M. Scott Douglass from “The Back Seat” section. 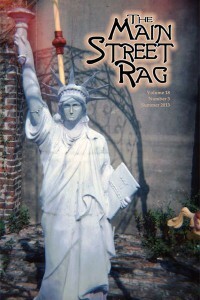 Cover price is $8, $6 if ordered from the MSR Online Bookstore. Books Reviewed: Transcendental Telemarketer by Beth Copeland, The Swamp Monster of Home by Catherine Carter, The Game of Boxes by Catherine Barnett, The Man Who Wouldn’t Stand Up by Jacob M. Appel, Ventrakl by Christian Hawkey, The Astronomer’s Pearl by George Young, Render by Collin Kelley. “I have long been a huge Walker Percy fan,” says documentary and fine art photographer Bryce Lankard with a charming Southern drawl. Lankard and the famed Southern author, Percy, have much in common. Both graduated from the University of North Carolina at Chapel Hill. As adults, both were drawn to New Orleans because of the city’s eccentric and seductive Southern culture. Both lived for a brief time in New York City. Percy loved telling stories with his pen, Lankard with his camera. This approach to the world, with eyes attentive to the moments, has served Lankard well. His images have been exhibited in galleries throughout the United States and internationally, such as in Spain, Germany, and France. His photographs have been published in Rolling Stone, Spin, The New York Times Magazine, Forbes, Allure, Newsweek, Time, and The Village Voice, among many others. In 1995 Lankard co-founded the celebrated periodical Tribe Magazine (New Orleans) and served as its creative director, garnering many awards for his photography and design. He was ArtNudes.com “Photographer of the Year” in 2002 and New Orleans Magazine’s “Person to Watch” in 2007. After Hurricane Katrina, and in an effort to help rebuild the arts community in New Orleans, he co-founded the nonprofit New Orleans Photo Alliance. Only recently did Lankard move back to his home state of North Carolina, where he continues to challenge himself creatively, taking photographs and also exploring the language of photography. Lankard offers art lectures throughout North Carolina. And he teaches classes, such as his popular “The Enduring Image: Defining Your Style and Vision” at Duke University’s Center for Documentary Studies and the Carrboro Arts Center. His website is: www.BryceLankard.com.